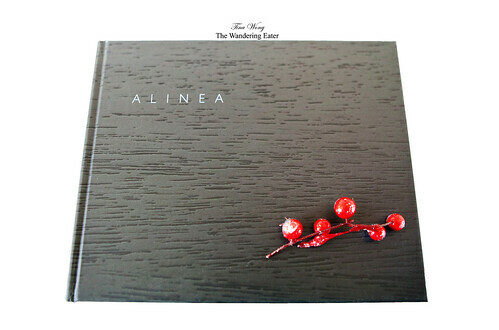 A friend of mine gave me a copy of Alinea‘s cookbook and it was part of my inspiration to head to Chicago earlier this month. 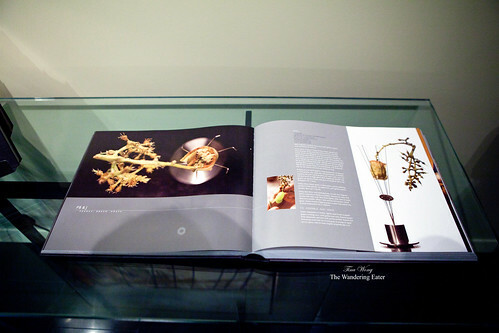 The gorgeous, colorful photos and the food presentations looked very unique (though I can’t fathom of cooking from this book). Also hearing and reading many good things about this restaurant, I simply have to eat here. Booking a table for this restaurant is, to say the least, a relatively nerve raking telephone game, especially for those who want dine there in less than 2 months in advance (like I did). The restaurant’s reservation line is only open at 12 PM Central time for the latter half of the week or you’ll be stuck talking to voicemail, which doesn’t mean you’ll get a spot until you speak to directly to a person. Because of my short notice, I requested to be placed on the wait list and mentioned that I’m flexible within certain dates. After that brief conversation, I hoped to get a phone call back from them for any openings. Somehow, my lucky stars were somehow working for me when I made my final attempt and call Alinea a few days before my departure to Chicago. When the young woman who picked up the phone and I made my request for any possible opening, she said, “I just had a cancellation” and it fell on one of the days I was in Chicago! Ecstatic, I booked the reservation and noted on my calender for this potentially momentous dinner. This was, and still is, the crown jewel of my Chicago excursion. When you walk or drive up to this restaurant, it’s not what I expected at all. It’s very understated. It looked like a brick townhouse with a glowing blue light at its window (you don’t see it as strong but it was there) and its address number. 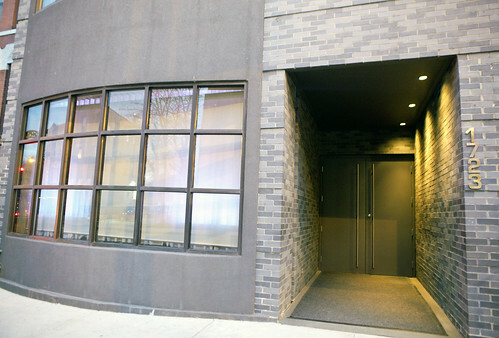 No sign to mention it is Alinea, unless you have seen a small board for its parking valet on the street. While waiting, I can’t but help watch the open kitchen, seeing the brigade of chefs (about 20) preparing the meals of other guests. Also, there’s a table with the restaurant’s own cookbook and Chef Grant Achatz’s memoir Life, on the Line to peruse through. As I’ve briefly mentioned earlier, the restaurant has two floors. 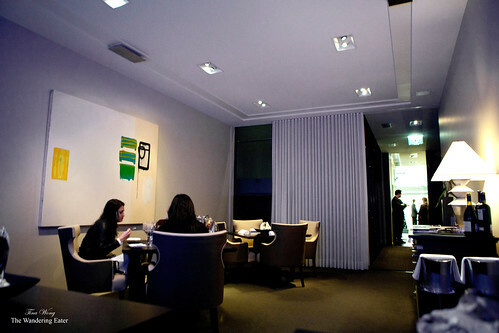 I dined at the smallish dining room on the ground floor with the bright blue light beaming behind me and two other pairs of guests who sat along the banquette. 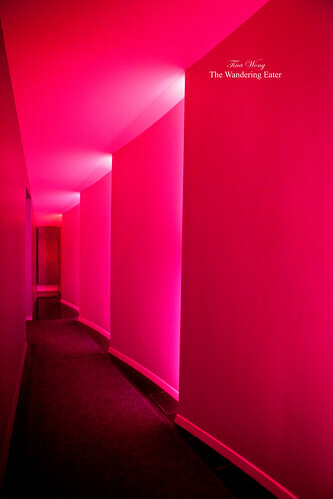 There was a four-top and a larger six-top closest to the room’s exit and large abstract painting. 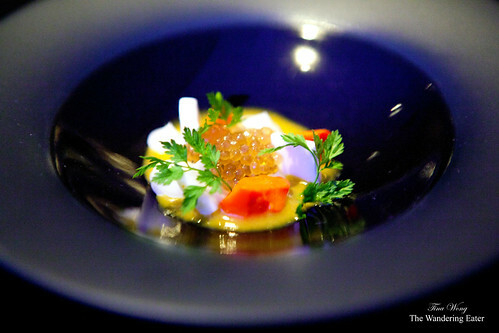 Not too long from that conversation, the first course was trout roe, carrot, coconut, curry. 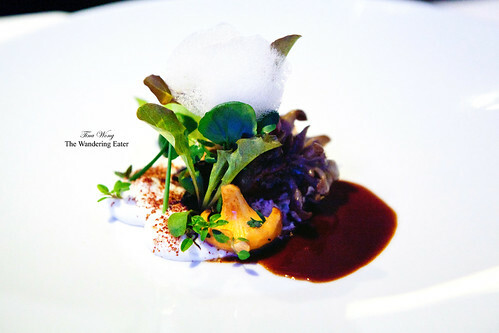 An interesting mix of flavors of the curry raita, creamy coconut, sweet carrot, and the “pop” from trout roe. My palate was awakened by the mildly spicy raita. Since my seat is literally a straight line to the kitchen, I had a pretty good view of who or possibly what is heading toward the table. For this particular course, I saw a waiter cautiously walking down from the kitchen carrying a very large tree trunk-like structure with some kind of plant matter wrapping it and set it down at the waiters station. In a few moments, it was carried over to my table. 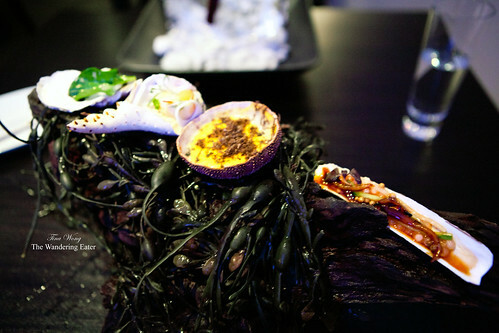 It was a tree trunk (or at least a heavy dark wooden structure) wrapped in fresh kelp, gently cradling my next three courses (or bites): oyster leaf, king crab, sea urchin, and razor clam and he gave a brief description of each. The oyster leaf was lightly dressed in traditional mignonette with a minute sprinkling of sea salt. The leaf does have the flavor of oyster and kind of have the texture. The crab was mixed in passionfruit purée, a sliver of heart of palm, pineapple, and all spice. 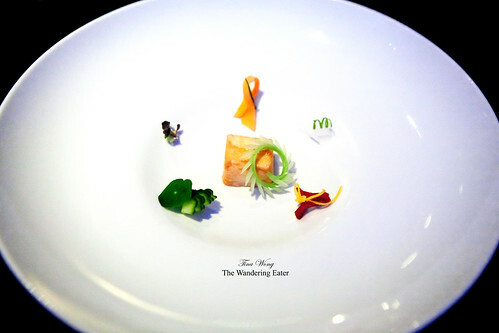 It tasted sweet, reflecting the crab’s inherent sweetness and it’s carrying the tropical theme from the first course. The uni (sea urchin) was very unexpected for me as it was mixed with sweet banana milk, making it a bit viscous and richer in texture, and the Burgundy black truffle shavings made it earthy. Unfortunately, the uni’s delicately flavor kind of gotten lost in this particular bite. The razor clam was the best of the four. Set within its own shell, this bivalve was given an Asian twist to it mixed with XO and soy sauces making it sweet and savory. The shiso gave it some refreshing nuance and some bits of crunchiness from the daikon. This entire course gave me the impression that I am eating on the beach, except I’m dressed in my eights and there’s no sight of sand remotely near me. Thank goodness. Marching on to the 6th course, Yuba, plated simply in a small black, dipping sauce-like bowl with a pool of sesame emulsion. The yuba (or also known as dried soybean skin) is wrapped in strands of shrimp, covered in miso, togarashi and orange toffee. This was simply amazing. 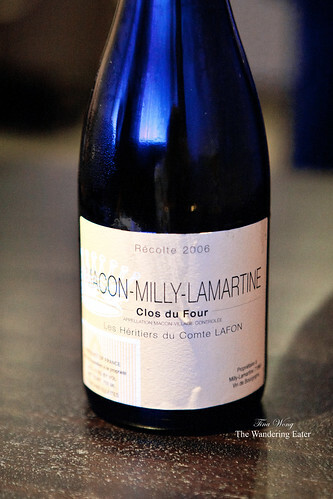 Crunchy, savory and sweet, hints of orange and pleasant hit of heat. The creamy nutty sesame emulsion is something I wish I can spread onto a sandwich (beyond being a fantastic dip for this yuba). I’m enamored. 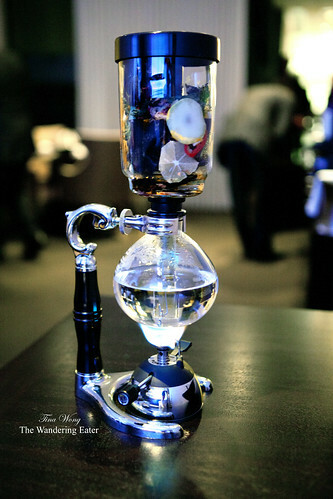 A few moments prior to the time I was presented the yuba, a waiter brought over a siphon and turned it on. No explanation except for a little comment that “this could be your entertainment.” Throughout the minutes that ticked by when I ate my yuba to the upcoming course, you see the liquid getting brewed and boiled like the siphon I use at home to brew my morning cup of coffee. 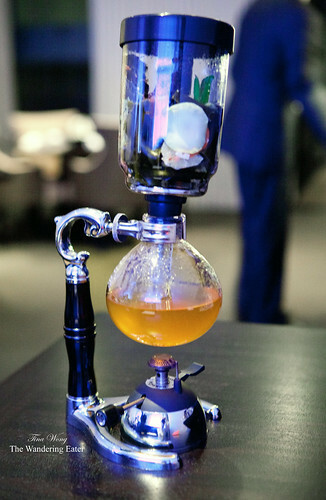 As promised, the mentioned siphon was brewing a ginger and konbu dashi. The dish accompanying it was Scallop. 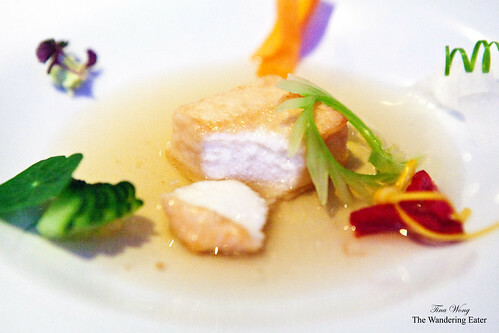 At first glance, this dish looks like and has the texture of agedashi tofu but it is actually a firm scallop mousse. This was genius. 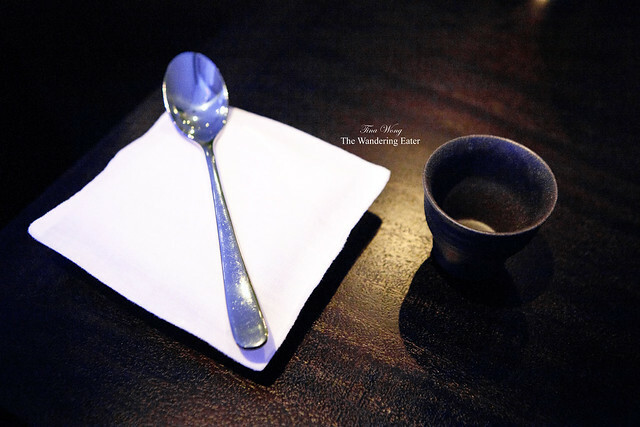 The dashi was served with the cube of scallop as well as in a small tea cup to sip and sample it alone. 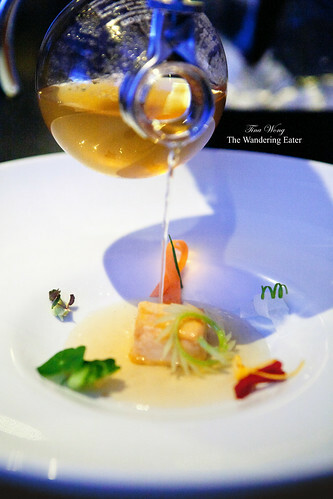 That dashi was briny, salty; a great complement to the sweet intense scallop. 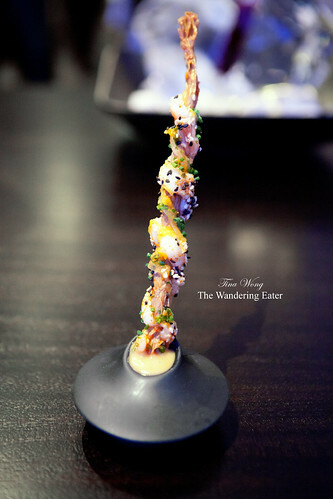 The Wooly Pig (or known as the mangalitsa pig) with squid, orange and fennel was set in a long, slender skewer that’s delicately balanced at an angle with a circular weight as its base. There were no utensils provided. The only instruction was to lean over and take it in one bite. 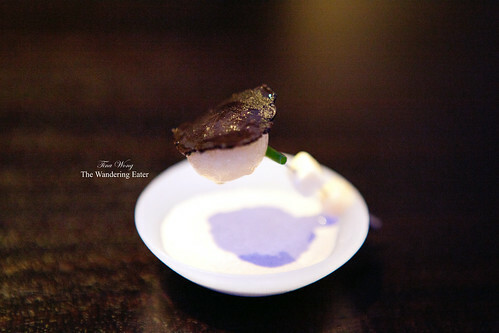 The lightness of the pig’s flavor melded with the squid that it almost becomes one. The gentle hit of orange zest and fine rings of anise-y fennel created a zesty bolt of flavor. 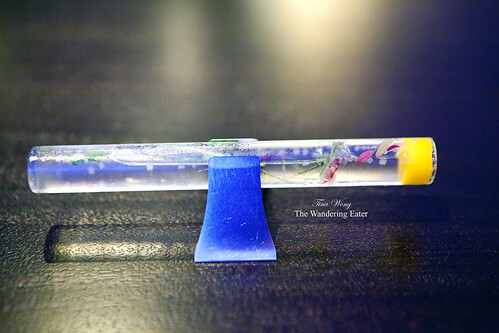 After clearing that all was provided was a glass tube on a pillow. 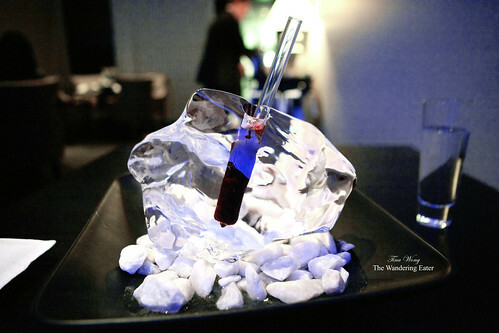 I was instructed that I should use this tube as a straw and drink inside the ice sculpture. 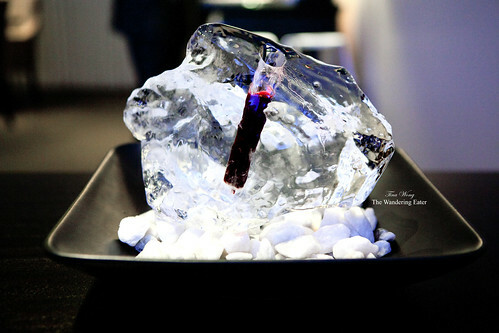 The mysterious dark burgundy red liquid was a blend of beet juice, hibiscus and licorice. It was earthy, sort of sweet and the haunting licorice flavor as the end note. Moving on to heartier fare, if you compared almost all the courses in this meal (so far and beyond), this course was called Scup (or known as porgy). This was inspired by one of Chef Grant Achatz’s research trips to Sicily for his newest restaurant, Next, cooking with Anna Tasca Lanza. He had a similar dish cooked while he was there and it amazed him how simple the dish was but incredibly complex in flavor. And now, this was part of the menu for this evening, despite the fact it steps away from the restaurant’s progressive American cooking techniques. 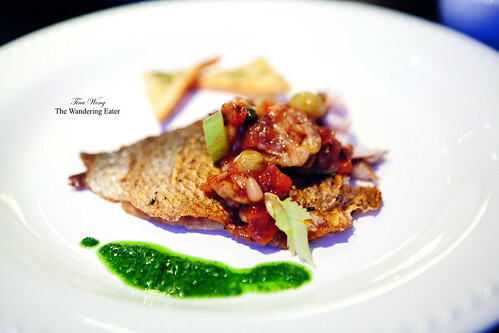 The scup was close to a do-it-yourself kind of plating. A plate of perfectly cooked whole scup its bones intact (the kitchen did separate the fish from its spine) but it’s all up to the diner to divvy up. A bowl delicious caponata that had a good amount of golden raisins to impart so much sweetness and there was a tinge of tart and bitterness in the background from the use of cocoa. The mint sauce made it all refreshing. The small basket of panella (chickpea chips) on the side, added the textural crunch I was craving. This course was paired with a beautiful Burgundian Chardonnay Macon Milly-Lamartine “Clos du Four” Récolte 2006. This was all utterly sublime. To take the foot off the pedal a little, the Hot Potato, Cold Potato as the server called it is a dainty serving in a small shallow bowl of warm, thin potato soup. 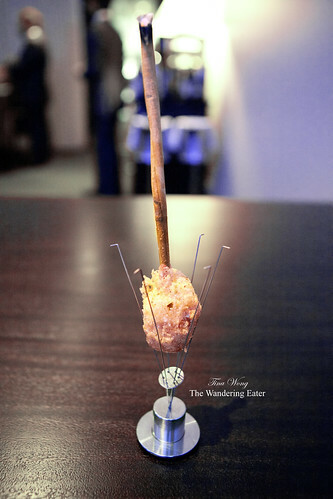 The metal pick skewered small orbs of cold potato and the largest potato was topped with a slice of Burgundy black truffle. How you’re supposed to eat this was to pull the pick away from you so all the potato pieces would gently fall onto the puddle of soup. 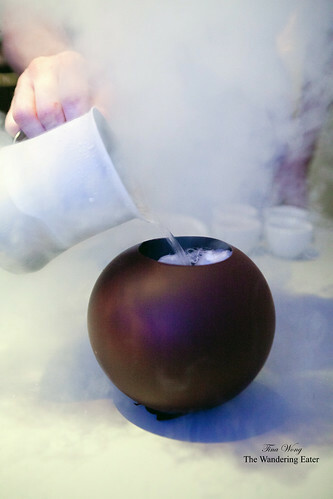 It all tasted familiar but the varying temperatures made it intriguing. 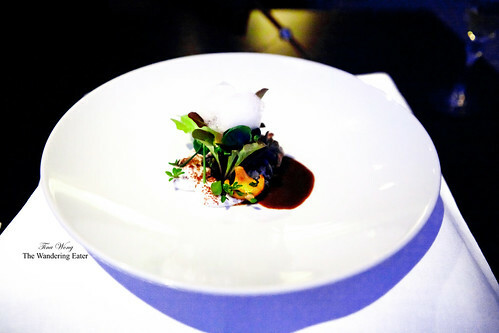 The 12th course, Wild mushrooms starts to work on your olfactory system. 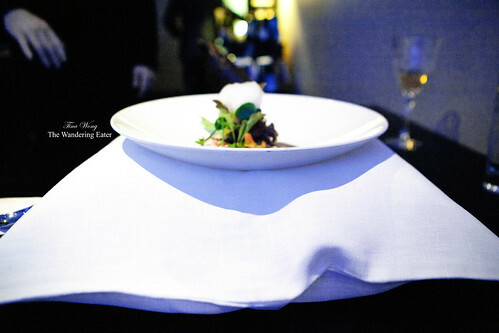 This dish was set upon a large pillow that’s filled with juniper air and the bag does have microscopic holes so it deflates slowly to envelop your dining space. As I start eating the mushrooms, I can’t help imagining I’m eating this near in forest, eating freshly sautéed chanterelle, hon shimeji, and maitake mushrooms with touches of pine and thyme creams to enrich the dish. 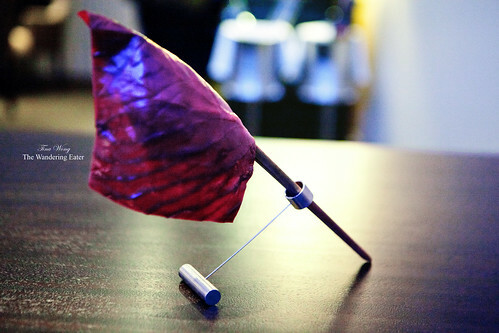 This course had another mysterious item that was left on the table before it was time to eat it – a “flag pole” of a blanched purple cabbage leaf after the “hot potato, cold potato” course. 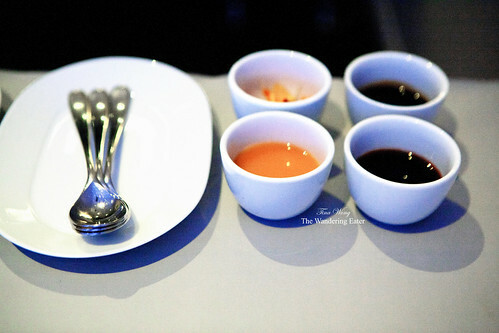 The waiter presented me a rectangular wooden tray with a frosted glass on top with neatly arranged condiments. Like most of the recent dishes, there’s some work needed to be done before any eating can be done. The instruction from the waiter was to lift the glass top off and set it aside. Take the two metal pieces and set it that the center is concave. 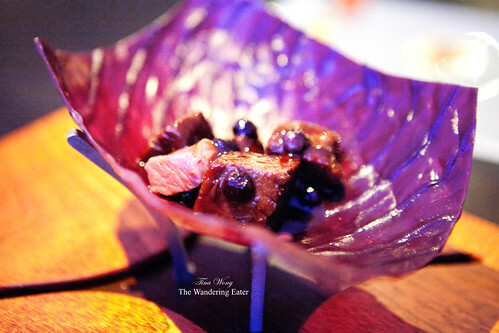 Then he takes the item that looks like a flag pole (which is really a steamed or poached purple cabbage leaf), set it on the metal bracket, and spoons in the mixture of venison loin and currants. The condiments on the glass plate: pickled red onion, radish, tomato confit, garlic confit, bacon mustard vinaigrette, radish, and Czech beer gel. (If you want to know what condiment is what, click on the photo of the glass plate) Everything is on that lettuce wrap (and yes, eating this was with eaten with hands, no utensils), it was the venison wrap of my dreams. 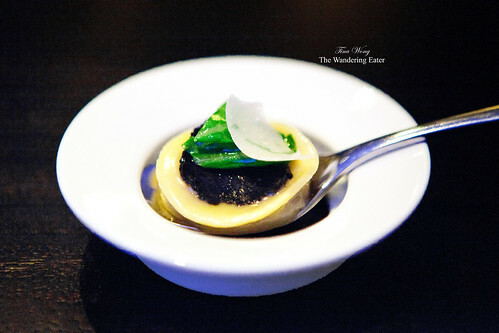 The Black truffle explosion is a small al dente raviolo that’s filled with a very warm truffle consommé set in an “antiplate.” The antiplate does intrigue me as it has no bottom. 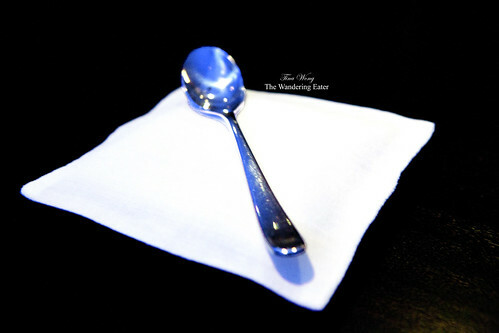 The spoon is pretty much the object that holds up the raviolo. 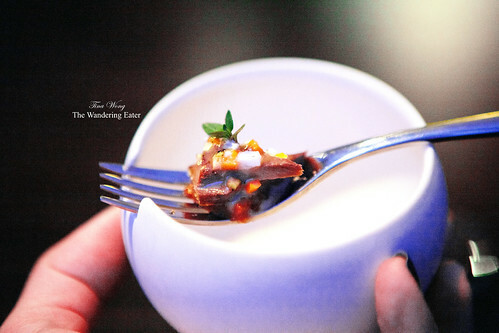 The Squab, inspired by Miró relied on the use of scent like 12th course of wild mushrooms, twofold. 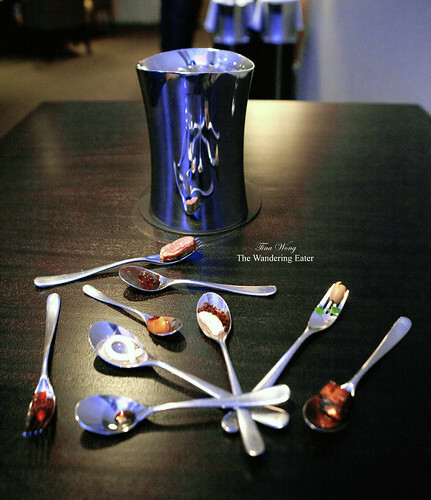 The table was rubbed down in a musky lavender oil and when the actual spoons of individual ingredients arrived, it also had a stainless steel vessel held smoldering lavender at the bottom, and it does hold the dirtied spoons after I ate through each one. 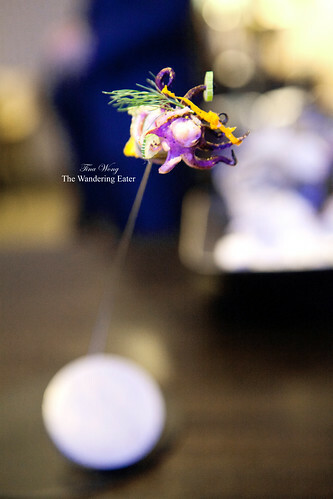 This entire course was inspired by Achatz’s visit to Tate Modern in the U.K. and saw the Miró exhibition. The concept behind this was to focus on the individual parts and how it creates a completes a cohesive dish in the end. 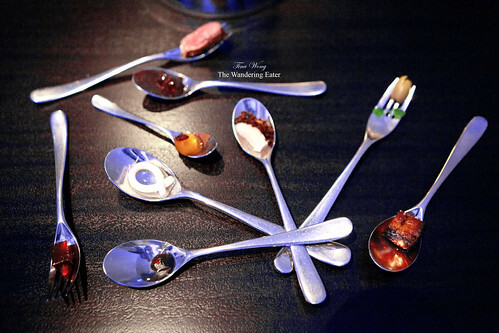 The spoons of squab, foie gras cube, prune puree, pomegranate jelly with red pepper, and so forth does create a cohesive “picture” in my head despite the fact I have to eat spoon/ingredient individually. Chestnut was presented in a round-bottomed bowl that I should not place this bowl on the table before it would topple. The fork full was a mixture of veal heart, quince, bergamot, and root vegetables with chestnut soup on the bottom of the bowl. 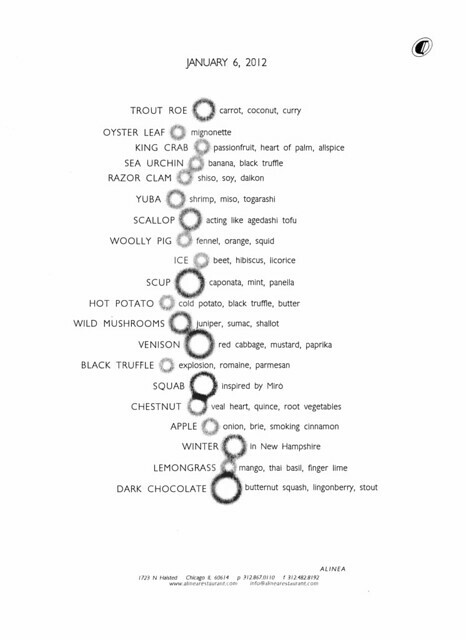 Though I can’t say the chestnut really stood out but each part of the dish were perfectly executed. Seeing and hearing a sweeter dish on the table, Apple, I know I’m toward the tail end of this epic meal. 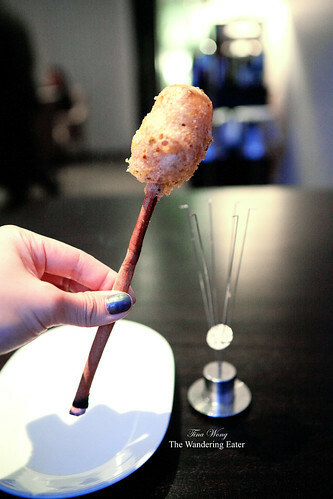 This fried knob of brie, apple, apple brandy, brown sugar pâte de fruit was set in a thick, smoldering cinnamon stick. It was instructed to be all taken in one bite. This delicately crisp, one-bite cheese course was pretty fantastic. 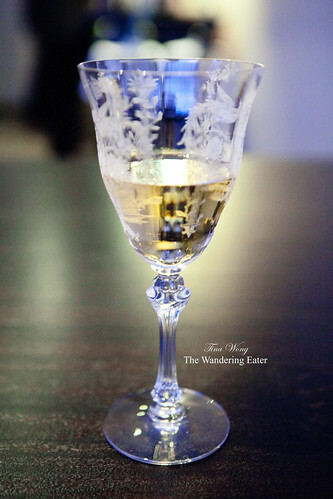 Gooey, luscious, creamy, kind of sweet from the apples and apple brandy. 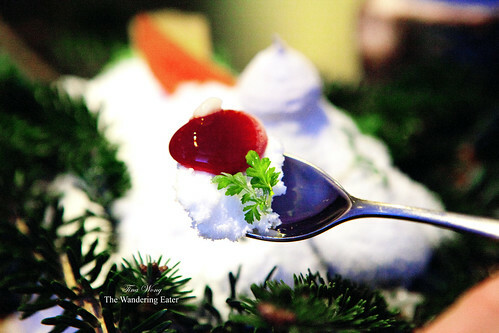 The 18th course, called Winter Wonderland (but written as “Winter in New Hampshire” on the menu, as seen later on) is in between palate cleanser and dessert. 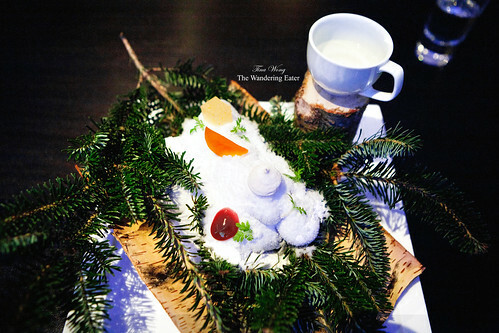 It’s peppermint snow, set on rocks and pine tree branches (neither of these are edible and supposedly, there were reports of diners accidentally trying to eat them), dotted with dark amber honey with parsley, a peppermint marshmallow, orange and quince gelée. 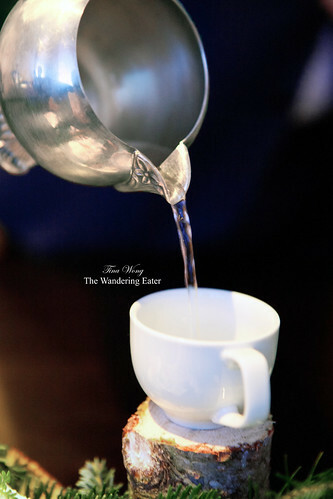 There was a side of a clear hot liquid which the waiter said, “I’ll let you think about what it is.” It was distilled hot chocolate. It kind of flabbergasted me to drink clear hot chocolate. 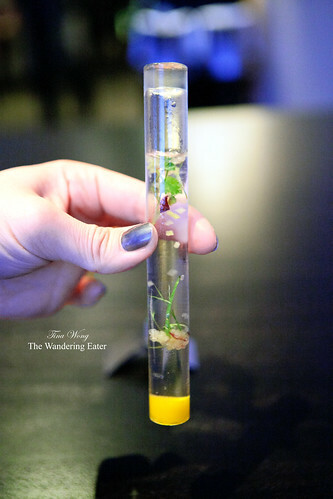 To clear out all the minty goodness from the previous dessert, this simple glass tube Lemongrass was filled with distilled lemongrass with tiny tendrils of Thai basil and fingerling basil. At the end of the tube, it was plugged with a mango and lime gel. It should be sucked out (quickly before it might land on your clothes) from the clear lime gel end. When the entire contents are in the mouth, it tasted like a very clean, basil lemonade with bits of jelly floating around. Very cool. If that embedded video doesn’t work, head over to my YouTube clip (in HD). Gorgeous, isn’t it? Beautiful and meticulously dotted by colorful syrups but the shattered, exploded, frozen chocolate ball made it beautifully imperfect. All you do simply just go at it. 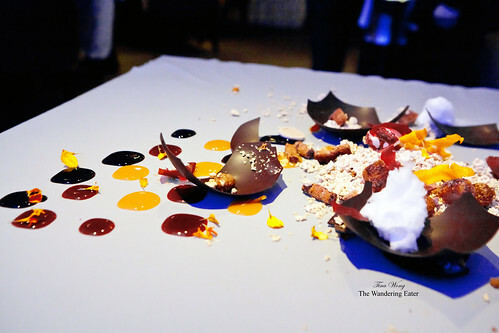 This dessert is generally made of dark chocolate (the hollow chocolate ball that’s filled with pieces of cotton candy, freeze dried brown sugar brioche, lingonberry and butternut squash crisps, and ice cream), sauces of butternut squash, lingonberry, bourbon syrup, and citrus marigolds. Each bite was different but it was delicious. Overall, this epic meal (and I hope you’re still there reading) was excellent. Boundaries were pushed in terms of plating. 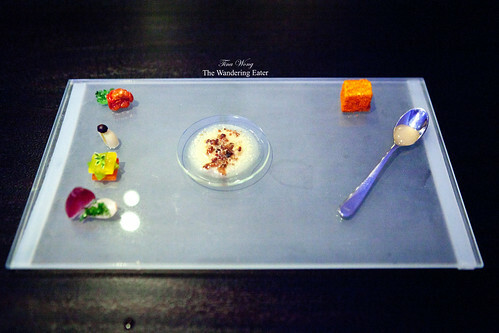 The food flavors, textures and varying temperatures made me think a bit about the food rather than simply just liking it. Service was unparalleled. They asked if I needed a cab to be hailed at the end of the meal – and that applied to every person who was leaving around the time I was. I can understand why it’s awarded 3 Michelin stars. At the end of my meal, I was presented a copy of their menu. It listed everything (all 20 courses) I ate that night. Despite the fact I’m one of those diners who tend to prefer knowing everything ahead of time what I’m eating, keeping me curious and on my toes actually gives a subtle thrill to discover a certain dish potentially can be one of the best things I’ve eaten. Oh gosh! 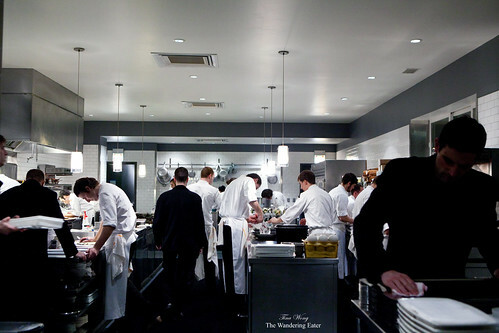 Amazing “Total Dining Experience” review. 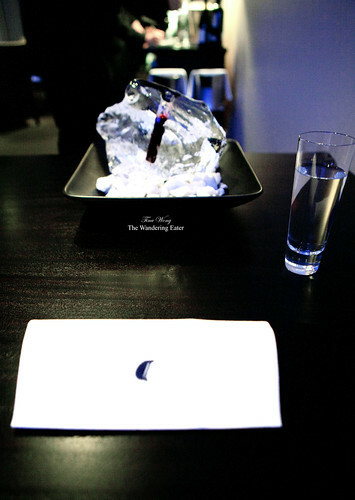 I had the opportunity to visit Alinea in December last year. 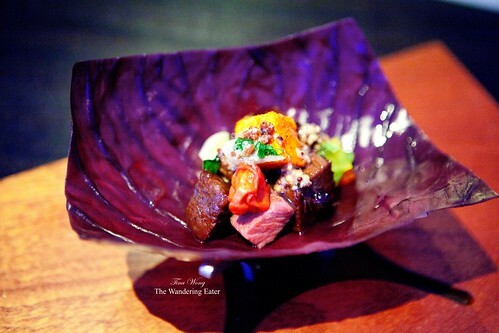 The service, presentation of the dishes, flavor combinations, everything was just spectacular! What was you’re favorite part of the dinner? Vanilla: Thank you! 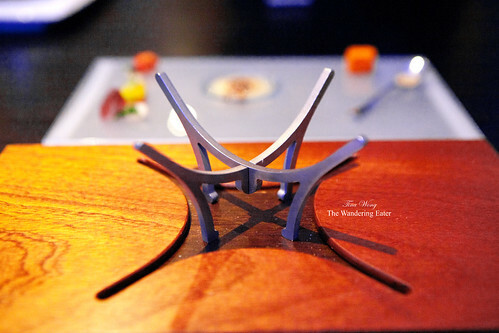 Frankly, Alinea is the most interesting restaurant in the U.S. right now. Majority of the restaurants I’ve written about so far tend to have good to excellent food but the presentations are generally things we’ve seen before. Yes, I found it humorous that my waiter said people attempted to eat the rocks and pine needles. But I guess the diners really thought the rocks were chocolates that look like rocks and pine needles were made of sugar or something like that. Eric: Thank you, as well! My favorite part of dinner? That’s hard. 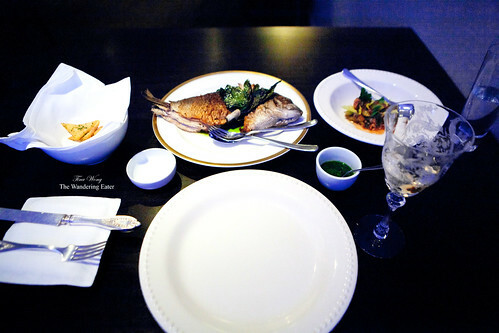 I can give you my favorite 3 courses – Yuba, the Sicilian inspired Scup, and the finale dessert. This meal looks amazing. Some of those dishes look too beautiful to eat. 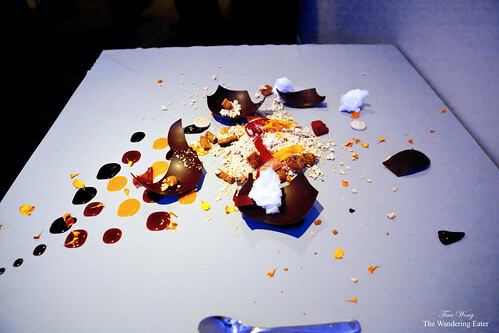 This meal was great and I do agree with you on the beautiful dishes, especially the dessert. 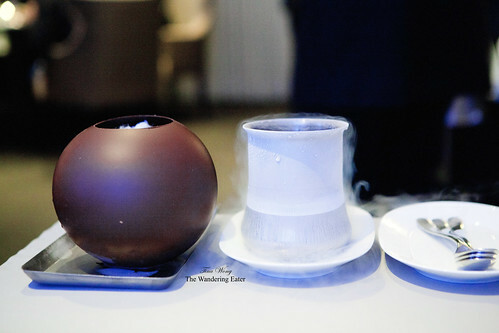 The distilled hot chocolate is so cool – what did it taste like? Did it really taste like hot chocolate? It simply tastes like hot chocolate but it doesn’t have the rich, creamy texture. Ashley: This meal is about $250, including the tax and tip. 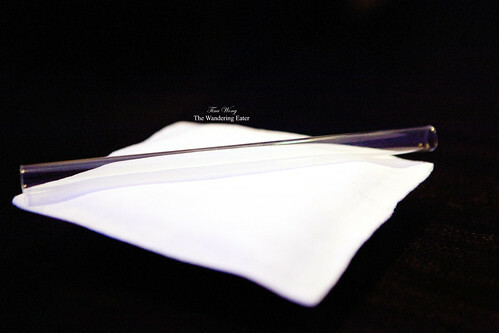 There’s no option to share or other menus to choose from (unless you or your dining companion has allergies or dietary restrictions, you should tell the reservationist and server – that’s a different story) and of course, not including wine pairings or other beverages. 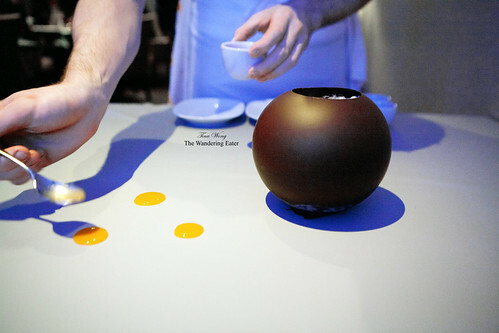 Personally, this meal was worth it because it’s very different than most food I’m used to seeing and eating in NYC (the exception is wd-50 but that restaurant has a different style/interpretation/inspirations for their menus, even though they’re both Modernist in technique).